"Telekinesis" redirects here. For other uses, see Telekinesis (disambiguation). For the South Korean film, see Psychokinesis (film). Psychokinesis (from Greek ψυχή "mind" and κίνησις "movement"), or telekinesis (from τηλε- "far off" and κίνηση "movement"), is an alleged psychic ability allowing a person to influence a physical system without physical interaction. Psychokinesis experiments have historically been criticized for lack of proper controls and repeatability. There is no convincing evidence that psychokinesis is a real phenomenon, and the topic is generally regarded as pseudoscience. Psychokinesis as an ability is especially common in popular culture, to the point of becoming a stock superpower. The word "psychokinesis" was coined in 1914 by American author Henry Holt in his book On the Cosmic Relations. The term is a linguistic blend or portmanteau of the Greek language words ψυχή ("psyche") – meaning mind, soul, spirit, or breath – and κίνησις ("kinesis") – meaning motion, movement. The American parapsychologist J. B. Rhine coined the term extra-sensory perception to describe receiving information paranormally from an external source. Following this, he used the term psychokinesis in 1934 to describe mentally influencing external objects or events without the use of physical energy. His initial example of psychokinesis was experiments that were conducted to determine whether a person could influence the outcome of falling dice. The word telekinesis, a portmanteau of the Greek τῆλε ("tēle") – meaning distance – and κίνησις ("kinesis") – meaning motion – was first used in 1890 by Russian psychical researcher Alexander N. Aksakof. In parapsychology, fictional universes and New Age beliefs, psychokinesis and telekinesis are different: psychokinesis refers to the mental influence of physical systems and objects without the use of any physical energy, while telekinesis refers to the movement and/or levitation of physical objects by purely mental force without any physical intervention. A panel commissioned in 1988 by the United States National Research Council to study paranormal claims concluded that "despite a 130-year record of scientific research on such matters, our committee could find no scientific justification for the existence of phenomena such as extrasensory perception, mental telepathy or ‘mind over matter’ exercises... Evaluation of a large body of the best available evidence simply does not support the contention that these phenomena exist." Carl Sagan included telekinesis in a long list of "offerings of pseudoscience and superstition" which "it would be foolish to accept (...) without solid scientific data". Nobel Prize laureate Richard Feynman advocated a similar position. Felix Planer, a professor of electrical engineering, has written that if psychokinesis were real then it would be easy to demonstrate by getting subjects to depress a scale on a sensitive balance, raise the temperature of a waterbath which could be measured with an accuracy of a hundredth of a degree centigrade, or affect an element in an electrical circuit such as a resistor, which could be monitored to better than a millionth of an ampere. Planer writes that such experiments are extremely sensitive and easy to monitor but are not utilized by parapsychologists as they "do not hold out the remotest hope of demonstrating even a minute trace of PK" because the alleged phenomenon is non-existent. Planer has written that parapsychologists have to fall back on studies that involve only statistics that are unrepeatable, owing their results to poor experimental methods, recording mistakes and faulty statistical mathematics. According to Planer, "All research in medicine and other sciences would become illusionary, if the existence of PK had to be taken seriously; for no experiment could be relied upon to furnish objective results, since all measurements would become falsified to a greater or lesser degree, according to his PK ability, by the experimenter's wishes." Planer concluded that the concept of psychokinesis is absurd and has no scientific basis. PK hypotheses have also been considered in a number of contexts outside parapsychological experiments. C. E. M. Hansel has written that a general objection against the claim for the existence of psychokinesis is that, if it were a real process, its effects would be expected to manifest in situations in everyday life; but no such effects have been observed. Psychologist Nicholas Humphrey argues that many experiments in psychology, biology or physics assume that the intentions of the subjects or experimenter do not physically distort the apparatus. Humphrey counts them as implicit replications of PK experiments in which PK fails to appear. The ideas of psychokinesis and telekinesis violate several well-established laws of physics, including the inverse square law, the second law of thermodynamics, and the conservation of momentum. Because of this, scientists have demanded a high standard of evidence for PK, in line with Marcello Truzzi's dictum "Extraordinary claims require extraordinary proof". The Occam's razor law of parsimony in scientific explanations of phenomena suggests that the explanation of PK in terms of ordinary ways — by trickery, special effects or by poor experimental design — is preferable to accepting that the laws of physics should be rewritten. Philosopher and physicist Mario Bunge has written that "psychokinesis, or PK, violates the principle that mind cannot act directly on matter. (If it did, no experimenter could trust his readings of measuring instruments.) It also violates the principles of conservation of energy and momentum. The claim that quantum mechanics allows for the possibility of mental power influencing randomizers — an alleged case of micro-PK — is ludicrous since that theory respects the said conservation principles, and it deals exclusively with physical things." In 1979, Evan Harris Walker and Richard Mattuck published a parapsychology paper proposing a quantum explanation for psychokinesis. Physicist Victor J. Stenger wrote that their explanation contained assumptions not supported by any scientific evidence. According to Stenger their paper is "filled with impressive looking equations and calculations that give the appearance of placing psychokinesis on a firm scientific footing... Yet look what they have done. They have found the value of one unknown number (wavefunction steps) that gives one measured number (the supposed speed of PK-induced motion). This is numerology, not science." Physicist Sean M. Carroll has written that spoons, like all matter, are made up of atoms and that any movement of a spoon with the mind would involve the manipulation of those atoms through the four forces of nature: the strong nuclear force, the weak nuclear force, electromagnetism, and gravitation. Psychokinesis would have to be either some form of one of these four forces, or a new force that has a billionth the strength of gravity, for otherwise it would have been captured in experiments already done. This leaves no physical force that could possibly account for psychokinesis. Physicist Robert L. Park has found it suspicious that a phenomenon should only ever appear at the limits of detectability of questionable statistical techniques. He cites this feature as one of Irving Langmuir's indicators of pathological science. Park pointed out that if mind really could influence matter, it would be easy for parapsychologists to measure such a phenomenon by using the alleged psychokinetic power to deflect a microbalance, which would not require any dubious statistics. "[T]he reason, of course, is that the microbalance stubbornly refuses to budge." He has suggested that the reason statistical studies are so popular in parapsychology is that they introduce opportunities for uncertainty and error, which are used to support the experimenter's biases. Cognitive bias research has suggested that people are susceptible to illusions of PK. These include both the illusion that they themselves have the power, and that the events they witness are real demonstrations of PK. For example, the illusion of control is an illusory correlation between intention and external events, and believers in the paranormal have been shown to be more susceptible to this illusion than others. Psychologist Thomas Gilovich explains this as a biased interpretation of personal experience. For example, someone in a dice game wishing for a high score can interpret high numbers as "success" and low numbers as "not enough concentration." Bias towards belief in PK may be an example of the human tendency to see patterns where none exist, called the clustering illusion, which believers are also more susceptible to. Some of the worst examples of confirmation bias are in research on parapsychology (...) Arguably, there is a whole field here with no powerful confirming data at all. But people want to believe, and so they find ways to believe. Psychologist Daniel Wegner has argued that an introspection illusion contributes to belief in psychokinesis. He observes that in everyday experience, intention (such as wanting to turn on a light) is followed by action (such as flicking a light switch) in a reliable way, but the underlying neural mechanisms are outside awareness. Hence, though subjects may feel that they directly introspect their own free will, the experience of control is actually inferred from relations between the thought and the action. This theory of apparent mental causation acknowledges the influence of David Hume's view of the mind. This process for detecting when one is responsible for an action is not totally reliable, and when it goes wrong there can be an illusion of control. This can happen when an external event follows, and is congruent with, a thought in someone's mind, without an actual causal link. As evidence, Wegner cites a series of experiments on magical thinking in which subjects were induced to think they had influenced external events. In one experiment, subjects watched a basketball player taking a series of free throws. When they were instructed to visualize him making his shots, they felt that they had contributed to his success. Other experiments designed to create an illusion of psychokinesis have demonstrated that this depends, to some extent, on the subject's prior belief in psychokinesis. A 2006 meta-analysis of 380 studies found a small positive effect that can be explained by publication bias. If you are doing a really convincing job, then you should be able to put a bent key on the table and comment, ‘Look, it is still bending’, and have your spectators really believe that it is. This may sound the height of boldness; however, the effect is astounding – and combined with suggestion, it does work. Between 1979 and 1981, the McDonnell Laboratory for Psychical Research at Washington University reported a series of experiments they named Project Alpha, in which two teenaged male subjects had demonstrated PK phenomena (including metal-bending and causing images to appear on film) under less than stringent laboratory conditions. James Randi eventually revealed that the subjects were two of his associates, amateur conjurers Steve Shaw and Michael Edwards. The pair had created the effects by standard trickery, but the researchers, being unfamiliar with magic techniques, interpreted them as proof of PK. A 2014 study that utilized a magic trick to investigate paranormal belief on eyewitness testimony revealed that believers in psychokinesis were more likely to report a key continued to bend than non-believers. In September 2006, a survey about belief in various religious and paranormal topics conducted by phone and mail-in questionnaire polled 1,721 Americans on their belief in telekinesis. Of these participants, 28% of male participants and 31% of female participants selected "agree" or "strongly agree" with the statement, "It is possible to influence the world through the mind alone." Parapsychologists divide psychokinetic phenomena into two categories: macro-psychokinesis - large-scale psychokinetic effects that can be seen with the naked eye, and micro-psychokinesis - small-scale psychokinetic effects that require the use of statistics to be detected. Some phenomena – such as apports, levitation, materialization, psychic healing, pyrokinesis, retrocausality, telekinesis, and thoughtography – are considered to be examples of psychokinesis. In 2016, Caroline Watt stated "Overall, the majority of academic parapsychologists do not find the evidence compelling in favour of macro-PK". There have been claimants of psychokinetic ability throughout history. Angelique Cottin (ca. 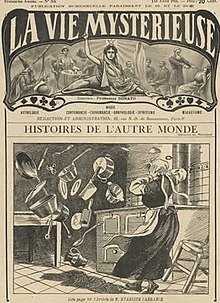 1846) known as the "Electric Girl" of France was an alleged generator of PK activity. Cottin and her family claimed that she produced electric emanations that allowed her to move pieces of furniture and scissors across a room. Frank Podmore wrote there were many observations which were "suggestive of fraud" such as the contact of the girl's garments to produce any of the alleged phenomena and the observations from several witnesses that noticed there was a double movement on the part of Cottin, a movement in the direction of the object thrown and afterwards away from it, but the movements so rapid they were not usually detected. Spiritualist mediums have also claimed psychokinetic abilities. Eusapia Palladino, an Italian medium, could allegedly cause objects to move during séances. However, she was caught levitating a table with her foot by the magician Joseph Rinn and using tricks to move objects by the psychologist Hugo Münsterberg. Other alleged PK mediums that were exposed as frauds, include Anna Rasmussen and Maria Silbert. 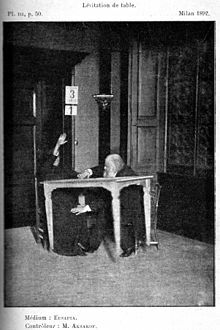 The Polish medium Stanisława Tomczyk active in the early 20th century claimed to be able to perform various acts of telekinesis, such as levitating objects, by way of an entity she called "Little Stasia". A photograph of her taken in 1909, which shows a pair of scissors "floating" in between her hands, is often found in books and other publications as an example of telekinesis. Scientists suspected Tomczyk performed her feats by the use of a fine thread or hair, running between her hands to lift and suspend the objects in the air. This was confirmed when psychical researchers who tested Tomczyk occasionally observed the thread. Many of India's "godmen" have claimed macro-PK abilities and demonstrated apparently miraculous phenomena in public, although as more controls are put in place to prevent trickery, fewer phenomena are produced. Swami Rama, a yogi skilled in controlling his heart functions, was studied at the Menninger Foundation in the spring and fall of 1970 and was alleged by some observers at the foundation to have telekinetically moved a knitting needle twice from a distance of five feet. Although Swami Rama wore a face-mask and gown to prevent allegations that he moved the needle with his breath or body movements, and air vents in the room had been covered, at least one physician observer who was present at the time was not convinced and expressed the opinion that air movement was somehow the cause. The Russian psychic Nina Kulagina came to wide public attention following the publication of Sheila Ostrander and Lynn Schroeder's best seller, Psychic Discoveries Behind The Iron Curtain. The alleged Soviet psychic of the late 1960s and early 1970s was filmed apparently performing telekinesis while seated in numerous black-and-white short films. She was also mentioned in the U.S. Defense Intelligence Agency report from 1978. [ISBN missing] Magicians and skeptics have argued that Kulagina's feats could easily be performed by one practiced in sleight of hand, through means such as cleverly concealed or disguised threads, small pieces of magnetic metal, or mirrors. James Hydrick, an American martial arts expert and psychic, was famous for his alleged psychokinetic ability to turn the pages of books and make pencils spin around while placed on the edge of a desk. It was later revealed by magicians that he achieved his feats by air currents. The psychologist Richard Wiseman has written Hydrick learnt to move objects by blowing in a "highly deceptive" and skillful way. Hydrick confessed to Dan Korem that all of his feats were tricks: "My whole idea behind this in the first place was to see how dumb America was. How dumb the world is." The British psychic Matthew Manning was the subject of laboratory research in the United States and England involving PK in the late 1970s and today claims healing powers. Magicians John Booth and Henry Gordon have suspected Manning used trickery to perform his feats. Boris Ermolaev, a Russian psychic, was known for levitating small objects. His methods were exposed on the World of Discovery documentary Secrets of the Russian Psychics (1992). Ermolaev would sit on a chair and allegedly move the objects between his knees but due to the lighting conditions a fine thread fixed between his knees suspending the objects was observed by the camera crew. Uri Geller was famous for his spoon bending demonstrations. The French psychic Jean-Pierre Girard has claimed he can bend metal bars by PK. Girard was tested in the 1970s but failed to produce any paranormal effects in scientifically controlled conditions. He was tested on January 19, 1977 during a two-hour experiment in a Paris laboratory. The experiment was directed by the physicist Yves Farge with a magician also present. All of the experiments were negative as Girard failed to make any of the objects move paranormally. He failed two tests in Grenoble in June 1977 with the magician James Randi. He was also tested on September 24, 1977 at a laboratory at the Nuclear Research Centre. Girard failed to bend any bars or change the structure of the metals. 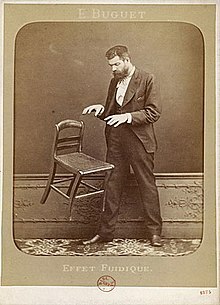 Other experiments into spoon bending were also negative and witnesses described his feats as fraudulent. Girard later admitted that he would sometimes cheat to avoid disappointing the public but insisted he still had genuine psychic power. Magicians and scientists have written that he produced all his alleged psychokinetic feats through fraudulent means. Stephen North, a British psychic in the late 1970s, was known for his alleged psychokinetic ability to bend spoons and teleport objects in and out of sealed containers. The British physicist John Hasted tested North in a series of experiments which he claimed had demonstrated psychokinesis, though his experiments were criticized for lack of scientific controls. [page needed] North was tested in Grenoble on 19 December 1977 in scientific conditions and the results were negative. According to James Randi, during a test at Birkbeck College North was observed to have bent a metal sample with his bare hands. Randi wrote "I find it unfortunate that [Hasted] never had an epiphany in which he was able to recognize just how thoughtless, cruel, and predatory were the acts perpetrated on him by fakers who took advantage of his naivety and trust." Ronnie Marcus, an Israeli psychic and claimant of psychokinetic metal bending, was tested in 1994 in scientifically controlled conditions and failed to produce any paranormal phenomena. 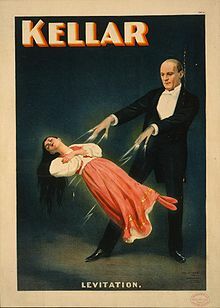 According to magicians, his alleged psychokinetic feats were sleight of hand tricks. Marcus bent a letter opener by the concealed application of force and a frame-by-frame analysis of video showed that he bent a spoon from pressure from his thumb by ordinary, physical means. Psychokinesis and telekinesis have commonly been used as superpowers in comic books, movies, television, computer games, literature, and other forms of popular culture. Notable portrayals of psychokinetic and/or telekinetic characters include the Teleks in the 1952 novella Telek; Carrie White in the Stephen King novel Carrie; Ellen Burstyn in the 1980 healer-themed film Resurrection; the Jedi and Sith in the Star Wars franchise; the Scanners in the 1981 film Scanners; Matilda Wormwood in the 1988 children's novel Matilda; three high school seniors in the 2012 film Chronicle; and Eleven from the Netflix series Stranger Things. ^ a b Random House Webster's Unabridged Dictionary (2nd ed.). New York: Random House. 2004. p. 1560. ISBN 9780375425998. Retrieved December 11, 2015. psycho-, a combining form representing psyche in compound words. ... (Gk, comb. form of psyche breath, spirit, soul, mind; akin to psycheim to blow). ^ a b McKean, Erin (2005). The New Oxford American Dictionary (2nd ed.). Oxford: Oxford University Press. p. 1367. ISBN 9780195170771. psycho. comb. form relating to the mind or psychology: . . . from Greek psukhe breath, soul, mind. ^ "psychokinesis (psychology". Encyclopædia Britannica. Retrieved April 11, 2014. ^ a b "telekinesis". Oxford Dictionaries. Retrieved July 18, 2014. ^ a b Xiong, Jesse Hong (2010). The Outline of Parapsychology (Revised ed.). Lanham: University Press of America. p. 141. ISBN 978-0761849452. Retrieved July 24, 2015. ^ a b c d e f g h Irwin, Harvey J. (2007). An Introduction to Parapsychology. McFarland. pp. 94–112. ISBN 9780786451388. Retrieved July 24, 2015. ^ a b "Psychokinesis (PK)". The Skeptic's Dictionary. January 15, 2014. Retrieved February 2, 2014. ^ Girden, Edward (1962). "A review of psychokinesis (PK)". Psychological Bulletin. 59 (5): 353–388. doi:10.1037/h0048209. ^ a b c Kurtz, Paul (1985). A Skeptic's Handbook of Parapsychology. Buffalo, New York: Prometheus Books. pp. 129–146. ISBN 978-0879753009. ^ a b c d Humphrey, Nicholas K. (1995). Soul Searching: Human Nature and Supernatural Belief. Chatto & Windus. pp. 160–217. ISBN 9780701159634. ^ Bunge, Mario (1983). Treatise on Basic Philosophy: Volume 6: Epistemology & Methodology II: Understanding the World. Springer. p. 226. "Despite being several thousand years old, and having attracted a large number of researchers over the past hundred years, we owe no single firm finding to parapsychology: no hard data on telepathy, clairvoyance, precognition, or psychokinesis." ^ a b Vyse, Stuart (2000). Believing in Magic: The Psychology of Superstition (1st ed.). Oxford: Oxford University Press. p. 129. ISBN 9780195136340. Retrieved December 11, 2015. [M]ost scientists, both psychologists and physicists, agree that it has yet to be convincingly demonstrated. ^ a b Sternberg, Robert J.; Roediger III, Henry J.; Halpern, Diane F. (2007). Critical Thinking in Psychology (1st ed.). Cambridge: Cambridge University Press. pp. 216–231. ISBN 9780521608343. Retrieved December 11, 2015. ^ "Parapsychology Foundation "Basic terms in Parapsychology"". Archived from the original on August 28, 2011. Retrieved December 22, 2006. ^ Holt, Henry (1914). On the Cosmic Relations (PDF). Cambridge, Massachusetts, USA: Houghton Mifflin Company/Riverside Press. Retrieved December 13, 2007. ^ a b c Sheehy, Noel (2002). Biographical Dictionary of Psychology. London: Routledge. pp. 476–. ISBN 9780415285612. Retrieved February 17, 2017. ^ "Glossary of Psi (Parapsychological) Terms (L-R)". Parapsychological Association. Retrieved April 11, 2014. ^ Spence, Lewis (2007). Encyclopedia of Occultism and Parapsychology (3rd ed.). Whitefish, Montana: Kessinger Publishing. pp. 752–753, 879, 912, 933. ISBN 9780766128170. Retrieved December 12, 2015. ^ Muldoon, Sylvia (2007). Psychic Experiences of Famous People (Reprint ed.). Kessinger Publishing. pp. 55–56. ISBN 9780548140529. ^ a b "telekinesis". The Skeptic's Dictionary. June 6, 2013. Retrieved June 11, 2014. ^ "telekinesis". Oxford Dictionaries. September 26, 2013. Retrieved October 2, 2013. ^ a b c d e Frazier, Kendrick (1991). The Hundredth Monkey: and other Paradigms of the Paranormal. Buffalo, New York: Prometheus Books. ISBN 9780879756550. Retrieved December 11, 2015. ^ a b c d Gilovich, Thomas (1993). How We Know What Isn't So (1st ed.). New York: Free Press. pp. 160, 169, 174–175. ISBN 9780029117064. Retrieved December 11, 2015. ^ a b c Park, Robert L. (2000). Voodoo Science: The Road from Foolishness to Fraud (Reprint ed.). Oxford: Oxford University Press. pp. 198–200. ISBN 9780198604433. Retrieved December 11, 2015. ^ Sagan, Carl (1996). The Demon-Haunted World: Science as a Candle in the Dark. New York: Headline. pp. 208–212. ISBN 9780747277453. Retrieved December 11, 2015. ^ Feynman, Richard P. (1999). The Meaning of It All: Thoughts of a Citizen-Scientist. London: Penguin. pp. 68–71. ISBN 9780140276350. Retrieved December 11, 2015. ^ a b Planer, Felix E. (1988). Superstition. London: Cassell. p. 242. ISBN 978-0304306916. ^ Planer, Felix E. (1988). Superstition. London: Cassell. p. 254. ISBN 978-0304306916. ^ Hansel, C.E.M. (1980). ESP and Parapsychology: A Critical Reevaluation (1st ed.). Buffalo, New York: Prometheus Books. pp. 196–198. ISBN 978-0879751197. ^ Hurley, Patrick J. (2012). A Concise Introduction to Logic (11th ed.). Boston, MA: Wadsworth Cengage Learning. p. 635. ISBN 978-0840034175. ^ Schick, Jr, Theodore (2010). How to Think about Weird Things: Critical Thinking for a New Age (6th ed.). Dubuque, Iowa: McGraw-Hill. p. 222. ISBN 978-0073535777. ^ Robert Scharff. (1968). The Las Vegas Experts' Gambling Guide. Grosset & Dunlap. p. 26. ^ Neher, Andrew (1990). The Psychology of Transcendence (2nd ed.). New York: Dover. p. 171. ISBN 978-0486261676. ^ a b Gardner, Martin (1986). Fads and Fallacies in the Name of Science (2nd ed.). New York: Dover Publications. ISBN 9780486203942. Retrieved December 11, 2015. ^ Frazier, Kendrick (1981). Paranormal Borderlands of Science. Buffalo, New York: Prometheus Books. pp. 60–65. ISBN 9780879751487. Retrieved December 11, 2015. ^ Bunge, Mario (2001). Philosophy in Crisis: The Need for Reconstruction. Amherst, New York: Prometheus Books. p. 176. ISBN 978-1573928434. ^ a b c Taylor, John (1980). Science and the Supernatural: An Investigation of Paranormal Phenomena Including Psychic Healing, Clairvoyance, Telepathy, and Precognition by a Distinguished Physicist and Mathematician. London: T. Smith. ISBN 978-0851171913. ^ Stenger, Victor J. (1990). Physics and Psychics: The Search for a World Beyond the Senses. Buffalo, New York: Prometheus Books. pp. 248–250. ISBN 9780879755751. ^ "Telekinesis and Quantum Field Theory: Cosmic Variance". Discover Magazine. February 18, 2008. Retrieved March 11, 2014. ^ a b Blackmore, Susan J. (1992). "Psychic Experiences: Psychic Illusions". Skeptical Inquirer. 16: 367–376. ^ a b Benassi, Victor A.; Sweeney, Paul D.; Drevno, Gregg E. (1979). "Mind over matter: Perceived success at psychokinesis". Journal of Personality and Social Psychology. 37 (8): 1377–1386. doi:10.1037/0022-3514.37.8.1377. ^ Blackmore, Susan; Trościanko, Tom (November 1985). "Belief in the paranormal: Probability judgements, illusory control, and the 'chance baseline shift'". British Journal of Psychology. 76 (4): 459–468. doi:10.1111/j.2044-8295.1985.tb01969.x. ^ a b Wiseman, Richard; Morris, Robert L. (February 1995). "Recalling pseudo-psychic demonstrations" (PDF). British Journal of Psychology. 86 (1): 113–125. doi:10.1111/j.2044-8295.1995.tb02549.x. hdl:2299/2288. ^ Sternberg, Robert J.; Roediger III, Henry J.; Halpern, Diane F. (2007). Critical Thinking in Psychology (1st ed.). Cambridge: Cambridge University Press. p. 292. ISBN 9780521608343. Retrieved December 11, 2015. Some of the worst examples of confirmation bias are in research on parapsychology (...) Arguably, there is a whole field here with no powerful confirming data at all. But people want to believe, and so they find ways to believe. ^ a b c Baer, John; Kaufman, James C.; Baumeister, Roy F. (2008). Are We Free? Psychology and Free Will (PDF). Oxford: Oxford University Press. p. Self is Magic. ISBN 9780195189636. Retrieved December 11, 2015. ^ Pronin, Emily; Wegner, Daniel M.; McCarthy, Kimberly; Rodriguez, Sylvia (2006). "Everyday magical powers: The role of apparent mental causation in the overestimation of personal influence" (PDF). Journal of Personality and Social Psychology. 91 (2): 218–231. CiteSeerX 10.1.1.405.3118. doi:10.1037/0022-3514.91.2.218. ISSN 0022-3514. PMID 16881760. Archived from the original (PDF) on January 5, 2011. Retrieved July 3, 2009. ^ a b Wilson, Krissy; French, Christopher C. (November 13, 2014). "Magic and memory: using conjuring to explore the effects of suggestion, social influence, and paranormal belief on eyewitness testimony for an ostensibly paranormal event". Frontiers in Psychology. 5: 1289. doi:10.3389/fpsyg.2014.01289. PMC 4230037. PMID 25431565. ^ Bösch, Holger; Steinkamp, Fiona; Boller, Emil (2006). "Examining psychokinesis: The interaction of human intention with random number generators--A meta-analysis". Psychological Bulletin. 132 (4): 497–523. doi:10.1037/0033-2909.132.4.497. PMID 16822162. ^ Carruthers, Peter. (2004). The Nature of the Mind: An Introduction. Routledge. 135-136. ^ Carroll, Robert Todd (2003). The Skeptic's Dictionary: A Collection of Strange Beliefs, Amusing Deceptions, and Dangerous Delusions. Hoboken, New Jersey: Wiley. p. 316. ISBN 9780471272427. Retrieved December 11, 2015. ^ a b Hines, Terence (2002). Pseudoscience and the Paranormal (2nd ed.). Amherst, New York: Prometheus Books. ISBN 9781573929790. Retrieved December 11, 2015. ^ Wiseman, Richard; Greening, Emma (February 2005). "It's still bending: Verbal suggestion and alleged psychokinetic ability" (PDF). British Journal of Psychology. 96 (1): 115–127. doi:10.1348/000712604x15428. PMID 15826327. ^ Harris, Ben (1985). Gellerism Revealed: the Psychology and Methodology Behind the Geller Effect. Calgary: M. Hades International. pp. 195–196. ISBN 9780919230927. ^ Colman, Andrew M. (1987). Facts, Fallacies and Frauds in Psychology. London: Hutchinson. pp. 195–185. ISBN 9780091730413. ^ "Randi $1,000,000 paranormal challenge". The Skeptic's Dictionary. Retrieved April 12, 2014. ^ Hutchinson, Mike (1988). "A Thorn in Geller's Side". British and Irish Skeptic (July/August): 2–4. ^ "JREF's status". James Randi Educational Foundation. Retrieved April 12, 2014. ^ "American Piety in the 21st Century: New Insights to the Depth and Complexity of Religion in the US" (PDF). Retrieved April 21, 2014. Study conducted by the Gallup Organization between October 8, 2005 and December 12, 2005 on behalf of the Baylor Institute for Studies of Religion, Baylor University, of Waco, Texas, in the United States. ^ "Themes: Psi Powers". Science Fiction Encyclopedia. Retrieved March 12, 2016. Fire-raising, alias pyrolysis or pyrokinesis, can be considered as a fine-tuned variant of Telekinesis – feeding kinetic energy to the target's individual molecules to increase its temperature rather than move it as a unit. ^ Smith, Jonathan C. (2010). Pseudoscience and Extraordinary Claims of the Paranormal: A Critical Thinker's Toolkit. Malden, Massachusetts: Wiley-Blackwell. p. 246. ISBN 978-1444310139. ^ Watt, Caroline (2016). Parapsychology: A Beginner's Guide. Oneworld Publications. p. 37. ISBN 9781780748870. ^ "New exhibit looks at occult photography - East Valley Tribune: Get Out". East Valley Tribune. Retrieved April 18, 2014. ^ a b Podmore, Frank (2011). Modern Spiritualism: A History and a Criticism. Cambridge: Cambridge University Press. pp. 41–42. ISBN 978-1108072588. ^ Christopher, Milbourne (1979). Search for the Soul (1st ed.). New York: Crowell. p. 47. ISBN 9780690017601. ^ Hansel, C.E.M. (1989). The Search for Psychic Power: ESP and Parapsychology Revisited. Buffalo, New York: Prometheus Books. p. 240. ISBN 9780879755164. ^ Moreman, Christopher M. (2013). The Spiritualist Movement: Speaking with the Dead in America and around the World. Santa Barbara: Praeger. pp. 77–78. ISBN 9780313399473. ^ Polidoro, Massimo (2001). Final Séance: The Strange Friendship Between Houdini and Conan Doyle. Amherst, New York: Prometheus Books. p. 103. ISBN 9781573928960. ^ Fodor, Nandor. (1934). These Mysterious People. Rider. Chapter 21. ^ "Stanisława Tomczyk photo description at Diomedia". Archived from the original on January 2, 2014. Retrieved November 18, 2013. Description page at a stock photo agency representing the Mary Evans Picture Library, where the date is also given as 1909. She visited the researcher in 1908 and 1909; hence, the exact year is uncertain and reported as 1908 elsewhere. ^ a b Jinks, Tony (2012). An Introduction to the Psychology of Paranormal Belief and Experience. Jefferson, North Carolina: McFarland. p. 11. ISBN 9780786465446. Retrieved December 11, 2015. ^ Carrington, Hereward (1990). The Story of Psychic Science (psychical research). Kila, Montana: Kessinger Publishing. p. 136. ISBN 9781564592590. ^ Wolman, Benjamin B. (1977). Handbook of Parapsychology. New York: Van Nostrand Reinhold. p. 320. ISBN 9780442295769. ^ Wiseman, Richard (1997). Deception & Self-deception: Investigating Psychics. Amherst, New York: Prometheus Books. pp. 182–196. ISBN 9781573921213. Retrieved December 11, 2015. ^ Kendrick Frazier (1986). Science Confronts the Paranormal. Prometheus Books. pp. 35–. ISBN 9781615926190. ^ Green, Elmer; Green, Alyce (1977). Beyond Biofeedback (2nd ed.). New York: Delacorte Press/S. Lawrence. pp. 197–218. ISBN 9780440005834. ^ "Beyond Biofeedback (chapter "Swami Rama")" (PDF). pp. 12–16. Retrieved July 24, 2007. Elmer Green's description of Swami Rama's alleged psychokinetic demonstration (with illustrations). ^ a b c Berger, Arthur S.; Berger, Joyce (1991). The Encyclopedia of Parapsychology and Psychical Research (1st ed.). New York: Paragon House. pp. 326, 341, 430. ISBN 9781557780430. ^ Paraphysics R&D - Warsaw Pact (U). Prepared by U.S. Air Force, Air Force Systems Command Foreign Technology Division. DST-1810S-202-78, Nr. DIA TASK NO. PT-1810-18-76. Defense Intelligence Agency. March 30, 1978. pp. 7–8. G.A. Sergevev is known to have studied Nina Kulagina, a well-known psychic from Leningrad. Although no detailed results are available, Sergevev's inferences are that she was successful in repeating psychokinetic phenomena under controlled conditions. G.A. Sergevev is a well-respected researcher and has been active in paraphysics research since the early 1960s. ^ "James Randi Educational Foundation — An Encyclopedia of Claims, Frauds, and Hoaxes of the Occult and Supernatural". Randi.org. Archived from the original on May 3, 2006. Retrieved March 17, 2014. ^ a b c d "Secrets of a Russian Psychic". Cicap.org. Retrieved March 14, 2014. ^ Couttie, Bob (1988). Forbidden Knowledge: The Paranormal Paradox. Cambridge: Lutterworth. p. 141. ISBN 9780718826864. ^ a b Stein, Gordon (1996). The Encyclopedia of the Paranormal (2nd ed.). Amherst, New York: Prometheus Books. p. 384. ISBN 9781573920216. ^ Regal, Brian (2009). Pseudoscience: A Critical Encyclopedia. Santa Barbara, California: Greenwood Press. p. 89. ISBN 9780313355073. ^ Wiseman, Richard (2011). Paranormality: Why We See What Isn't There. London: Macmillan. pp. 81–95. ISBN 9780230752986. ^ Korem, Dan (1988). Powers: Testing the Psychic & Supernatural. Downers Grove, Illinois: InterVarsity Press. p. 149. ISBN 978-0830812776. ^ Cavendish, Richard (1995). Man, Myth & Magic: The Illustrated Encyclopedia of Mythology, Religion and the Unknown (New ed.). New York: M. Cavendish. p. 2442. ISBN 9781854357311. Retrieved December 11, 2015. Spiritualism aroused violent antagonism and criticism concentrating particularly on the physical phenomena occurring at seances, which opponents claimed were faked. ^ Booth, John (1986). Psychic Paradoxes. Buffalo, New York: Prometheus Books. pp. 12–57. ISBN 978-0879753580. ^ Gordon, Henry (1988). Extrasensory Deception: ESP, Psychics, Shirley MacLaine, Ghosts, UFOs (Canadian ed.). Toronto: Macmillan of Canada. pp. 101–102. ISBN 978-0771595394. ^ a b Randi, James (1982). The Truth About Uri Geller (Revised ed.). Buffalo, New York: Prometheus Books. ISBN 978-0879751999. ^ a b c d Blanc, Marcel (February 16, 1978). "Fading spoon bender". New Scientist. 77 (1090): 431. ISSN 0262-4079. Retrieved February 17, 2017. ^ Jones, Warren H.; Zusne, Leonard (1989). Anomalistic Psychology: A Study of Magical Thinking (2nd ed.). Hillsdale, New Jersey: L. Erlbaum. ISBN 978-0805805086. ^ Hasted, John (1981). The Metal-Benders. London: Routledge & Paul. ISBN 978-0710005977. ^ Gardner, Martin (1991). The New Age: Notes of a Fringe watcher. Buffalo, New York: Prometheus Books. pp. 28–29. ISBN 978-0879756444. ^ Randi, James (1987). Flim-Flam! : Psychics, ESP, Unicorns, and Other Delusions (9th ed.). Buffalo, New York: Prometheus Books. ISBN 978-0879751982. ^ "George Houck Obituary". Los Angeles Times. Legacy.com. Retrieved April 18, 2014. ^ "The Song Remains the Same". James Randi Educational Foundation. Retrieved March 13, 2014. ^ Nickell, Joe. "Mind Over Metal - CSI". Committee for Skeptical Inquiry. Retrieved March 13, 2014. ^ "Randi's Geller Hotline for 1994: Ronnie at Berkeley". Mindspring.com. April 5, 1994. Retrieved March 13, 2014. ^ "Twenty Technologies That Can Give You Super Powers: Super Power: Psychokinesis". BusinessWeek. Archived from the original on January 11, 2014. Retrieved April 11, 2014. ^ Gresh, Lois; Weinberg, Robert (2002). The Science of Superheroes. Hoboken, New Jersey: J. Wiley. p. 131. ISBN 9780471024606. Retrieved December 11, 2015. Every member of the X-Men had a code name that matched his or her super power. Thus, Archangel, Warren Worthington III, had wings and could fly. Cyclops, Scott Summers, shot deadly power beams from his eyes. Jean Grey, Marvel Girl, was a telekinetic and also a telepath. . . .
^ "CellFactor®: Psychokinetic Wars". Playstation. January 22, 2014. Retrieved April 11, 2014. ^ Vance, Jack (January 1952). "Telek". Astounding Science Fiction. ^ "Carrie (1976) - Overview". MSN Movies. Retrieved April 11, 2014. ^ "Resurrection (1980) - Awards & Nominations". MSN Movies. Archived from the original on January 2, 2014. Retrieved April 11, 2014. ^ Windham, Ryder; Wallace, Dan (2012). Star Wars: The Ultimate Visual Guide (Updated and expanded. ed.). London, England: Dorling Kindersley Publishing. pp. 19, 21. ISBN 9780756692483. Page 19 "Object Movement": "Although such ability is commonly known as a Jedi 'object movement' power, it is more accurately described as a manipulation of the Force — the energy field that surrounds and binds everything — to control the direction of objects through space. Jedi utilize this talent not only to push, pull, and lift objects, but also to redirect projectiles and guide their starships through combat." Page 21 "Sith Powers" [illustration caption]: "Levitating his adversary and choking him in a telekinetic stranglehold, Dooku simultaneously relieves Vos of his lightsaber." ^ "Scanners". Rotten Tomatoes. Retrieved April 11, 2014. ^ Serena Allott (November 26, 2010). "Waltzing Matilda: Dahl's classic dances on to the stage". Daily Telegraph. Retrieved August 9, 2016. ^ Sharkey, Betsy (February 3, 2012). "Review: 'Chronicle' is smart about its telekinetic teens". Los Angeles Times. Retrieved April 11, 2014. ^ Chaney, Jen (July 18, 2016). "Stranger Things' Millie Bobby Brown on Playing Eleven, Her Love-Hate Relationship With Scary Movies, and Acting Without Speaking". Vulture. Retrieved October 16, 2016. Henry Gordon (1988). Extrasensory Deception: ESP, Psychics, Shirley MacLaine, Ghosts, UFOs (Canadian ed.). Toronto: Macmillan of Canada. ISBN 978-0771595394. David F. Marks (2000). The Psychology of the Psychic (2nd ed.). Amherst, New York: Prometheus Books. ISBN 978-1573927987. Richard Wiseman (1997). Deception & Self-Seception: Investigating Psychics. Amherst, New York: Prometheus Books. ISBN 9781573921213. Panati, Charles (1974). Supersenses, Our Potential for Parasensory Experience. New York: Times Books. ISBN 9780385111928. This page was last edited on 11 April 2019, at 14:25 (UTC).